The problem with most musical documentaries is that they do not give enough time for the music. This is not the case in Grateful Dawg, which is great in that it contains nearly nonstop music from collaborative efforts of Grateful Dead frontman Jerry Garcia and David Grisman. The issue here is that this movie is nothing more than a love letter from director Gillian Grisman. For fans of Garcia, Grisman, and music, this is a great documentary to watch. However, Grateful Dawg does not pretend to present an objective view. This has its good and bad points, but the movie is so one-sided and gushy that it soon becomes uninteresting. Garcia and Grisman ("beards of a feather" as one person called them) shared a bluegrass background and a love for obscure folk music. They knew about each other over the years, but met after years. Once together, they kindled a friendship that lasted until Garcia's death in 1995. Together, they made five albums that varied diversely in terms of style and substance. 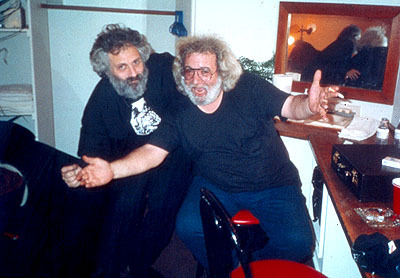 Grisman believed that Garcia felt comfortable jamming with him. There was no huge burden upon Garcia's shoulders of being the leader of his own American movement. Instead, Grisman's house was just a place he could relax and be one of the boys. Gillian Grisman does cull together some remarkable behind-the-scenes footage including some audio interviews with Garcia. There are fascinating scenes of Grisman and Garcia recording music with the Grisman Quartet, discussing what they like and what to change. Most important of all, Gillian Grisman allows plenty of time for the music to play. It flows smoothly from live performances, to recording sessions and practice jams. There's even an unreleased music video with Garcia and Grisman in (gasp!) tuxedos. There is just not a lot of meat behind the music. There is only so much praise one can listen to before it becomes a little boring. That's another reason why this movie is so short, but feels longer. There is no real substance behind the observations or testimonials. 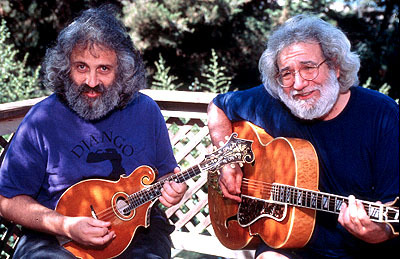 Perhaps some detractors would make the Garcia/Grisman work seem even stronger. It's great hearing Garcia and Grisman play, but one can get nearly the same effect with the CD and a good sound system. 1 hour, 21 minutes, Rated PG-13 for brief language.